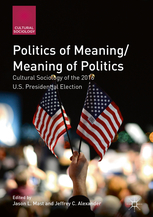 Politics of Meaning/Meaning of Politics: Cultural Sociology of the 2016 U.S. Presidential Election, edited by CCS Faculty Fellow Jason Mast and CCS Director Jeffrey Alexander, has just been published by Palgrave MacMillan as part of the Cultural Sociology Series. Included are essays by CCS Fellows Jeffrey Alexander, Mabel Berezin, Ruth Braunstein, Roger Friedland, Ronald Jacobs, Jason Mast, Matthew Norton, Alexander Riley, Lyn Spillman and Robin Wagner-Pacifici. Also with essays by Philip Gorski, Daniel Kreiss, Peter Kivisto and Francesca Polletta.